1. Testis buffer: 183 mM KCl, 47 mMNaCl, 10 mMTris-HCl, pH 6.8 or TBI: 15 mM potassium phosphate (equimolar dibasic and monobasic), pH 6.7, 80 mM KCl, 16 mM NaCl, 5 mM MgCl2, 1% polyethylene glycol (PEG) 6000. Fig. 5. 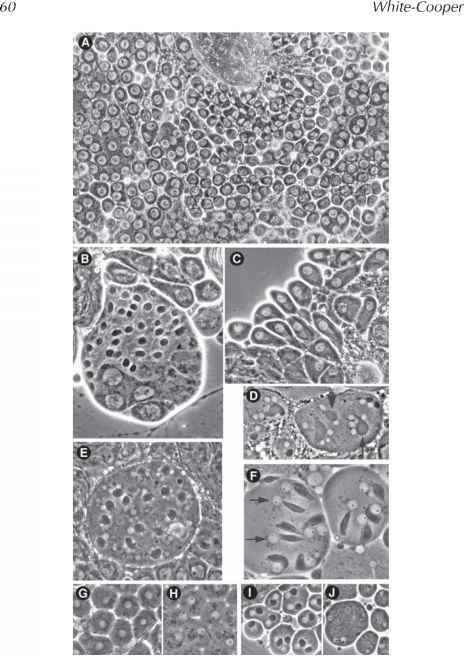 (opposite page) Meiosis I progression in wild-type spermatocytes observed by time-lapse phase-contrast and fluorescence microscopy. Meiosis was followed from early prometaphase to the end of meiosis I at a rate of 20 frames/min using a combination of phase contrast (left panels) and fluorescence (right panels) microscopy. The chromosomes were labeled with a His2-GFP fusion protein (right panels). Five significant time-points are shown in this figure, reproduced from Rebollo and Gonzalez (41): 0' corresponds to late prophase, the two centrosomes have migrated to opposite poles and organized large asters. 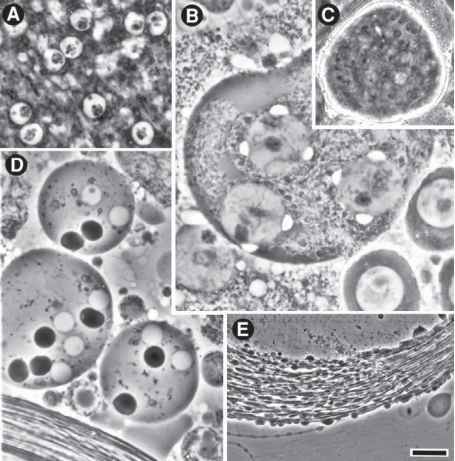 The meiotic spindle is forming and is highlighted with phase dark mitochondria (asterisks). A nonchromosomal phase dark nuclear structure, which remains throughout meiosis, can be seen (arrowhead). At 32', the sperma-tocyte contains a fully formed elongated spindle. Two bivalents are stabilized at the metaphase plate in this focal plane (arrows). At 37', anaphase has just started. Two pairs of homologous chromosomes can be seen segregating from each other (double arrows). At 41', the chromosomes have reached the poles and are decondensing. Chromosome decondensation is first apparent midway through anaphase. At 55', the two daughter nuclei have formed (arrows) and the cleavage furrow begins to pinch the central spindle (white arrowheads). 2. Dissecting plate; for example, a 10-cm-diameter plastic Petri dish with the sides removed. 3. Sharp forceps (the sharper the better). 4. Tungsten mounted needles (sharp!). 5. Microscope slides and cover slips, 22 x 22 mm2. 6. Phase-contrast compound microscope with camera. 8. Hoechst 33342 (bis-benzimide; e.g., Sigma-Aldrich) (1 mg/mL stock). Store in the dark at 4°C. Dilute in dissection buffer to 2-5 |g/mL when needed. 10. Halocarbon oil (Voltalef 10S).